On Tuesday 28 August during an Inquiry lesson on Sound, Grade 1L watched a video clip on how we can see and hear sound through vibration. We started off with a bowl, cling wrap and a metal object to see if the experiment would work. The experiment didn’t work, which then challenged the students to look around the room for objects that would help to make the rice move through vib ration. The children were engaged in the discussion and experimentation. The next day 1L tried using a different object that would project the sound and cause the vibration to be seen. 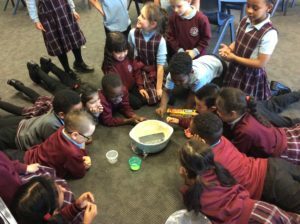 The children were amazed at how well the experiment worked and they were able to see and hear sound through vibration.